Florian Jozefzoon's late strike piled more pressure on Hull boss Nigel Adkins as Derby inflicted a fourth successive home defeat on the Tigers. Martyn Waghorn converted from the spot after David Nugent was brought down by Jordy de Wijs to give Frank Lampard's side a deserved first-half lead. Hull equalised against the run of play as Todd Kane converted after an excellent through ball from Evandro. But Jozefzoon's deflected shot at the back post beat David Marshall following a low cross from Mason Bennett. 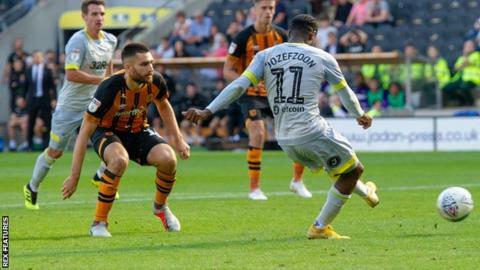 It was the second time in four days that Derby had won at the KCOM Stadium - they were 4-0 victors in the second round of the Carabao Cup at Hull on Tuesday, when Jozefzoon scored twice. Hull have scored just twice at home in all competitions this season, losing four of their last six games and are above the relegation zone by goal difference only. Derby, who rose to fourth after a fourth successive win in all competitions, could have had the game settled well before half-time. Waghorn had an early penalty appeal turned down, while with six minutes left of the half the impressive Mason Mount forced David Marshall into great save before Nugent headed the resulting corner against the bar. After Kane's equaliser, Hull could have gone ahead as Derby failed to clear their lines and Evandro put an effort narrowly wide of Scott Carson's goal before the former England stopper saved well from Markus Henriksen with 20 minutes left. "I thought we were very good today. I talked on Tuesday night about what a good side they were. Today I thought technically we were spot-on. "The penalty looked a very clumsy challenge. David Nugent being an experienced forward has obviously ended up on the floor and the referee has chosen to give a penalty. "The passion was there for all to see, the quality was there for all to see and the team spirit was there." "It was a tough game, the second half was very tough. That's the Championship. "Full credit to Hull. They will feel they deserved a draw. Match ends, Hull City 1, Derby County 2. Second Half ends, Hull City 1, Derby County 2. Attempt missed. Jordy de Wijs (Hull City) header from the centre of the box is too high. Assisted by Jarrod Bowen with a cross following a corner. Corner, Hull City. Conceded by Bradley Johnson. Attempt blocked. Jarrod Bowen (Hull City) left footed shot from the centre of the box is blocked. Assisted by Markus Henriksen. Attempt blocked. Will Keane (Hull City) left footed shot from the centre of the box is blocked. Assisted by Stephen Kingsley. Goal! Hull City 1, Derby County 2. Florian Jozefzoon (Derby County) left footed shot from the centre of the box to the centre of the goal. Assisted by Mason Bennett. Substitution, Hull City. Jon Toral replaces Todd Kane. Substitution, Hull City. Nouha Dicko replaces Evandro. Corner, Derby County. Conceded by Stephen Kingsley. Corner, Hull City. Conceded by Fikayo Tomori. Will Keane (Hull City) wins a free kick on the right wing. Delay in match Stephen Kingsley (Hull City) because of an injury. Substitution, Derby County. Craig Forsyth replaces Scott Malone. Attempt missed. Evandro (Hull City) right footed shot from the centre of the box is high and wide to the right. Assisted by Will Keane. Attempt saved. Markus Henriksen (Hull City) right footed shot from the right side of the box is saved in the centre of the goal. Assisted by Eric Lichaj. Offside, Hull City. David Marshall tries a through ball, but Todd Kane is caught offside. Attempt blocked. David Nugent (Derby County) right footed shot from the centre of the box is blocked. Assisted by Mason Mount. Corner, Derby County. Conceded by Jordy de Wijs.